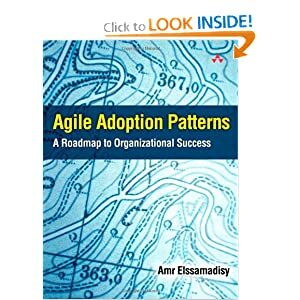 I have written two books on Agile adoption. These books focus on the “how to” of Agile. So, if you are interested in test driven development, and want to get from “I know what test driven development is” to “I am practicing test driven development successfully”, then these books are for you. I have often been asked by what I mean by practices and patterns. My answer is two-fold. Practices are fine grained things that we do in the Agile world. Refactoring is a practice, stand up meetings are a practice, and iterations are a practice. (This is in contrast to Scrum, eXtreme Programming, KanBan and other processes which are collections of practices.) Patterns are common ways that individuals and teams have used these practices to develop software. Patterns are an aggregation of experiences. The first of these books is available for free download at InfoQ.com and is entitled Patterns of Agile Practice Adoption: The Technical Cluster. This book focuses on the technical practices of Agile development such as refactoring, test driven development and automated acceptance tests. The second of these books, Agile Adoption Patterns: A Roadmap to Organizational Success takes a more comprehensive look at Agile adoption. This is a more complete volume that covers creating an Agile adoption strategy and over 30 different practices documented in pattern format. This book is available on Amazon.com and is currently used by teams and organizations that have embarked on an Agile transformation as a reference and guide and is being taught in many undergraduate and graduate software engineering programs.